Take Hwy 62 west to 187 South turn left (RiverLake Gas Station on the corner). Go 4 miles and take the left fork in the road (lots of signs in the fork including ours) onto Mundell Road. Go 2 miles, we are located on the righthand side of the road, large two story log building with lit open sign. At Bentonville, take exit 86 onto 62 east and go 27 miles. Go one mile past 187 north and turn RIGHT onto 187 south (you will see a large sign saying Beaver Dam). Go 5 miles on 187 and watch very carefully for Mundell Road (if you go as far as Horizon Realty, you’ve gone 1/2 mile too far). Take a hard switchback right onto Mundell Road. Go 2 miles down and we are located on the right hand side of the road, large two story log building with lit open sign. 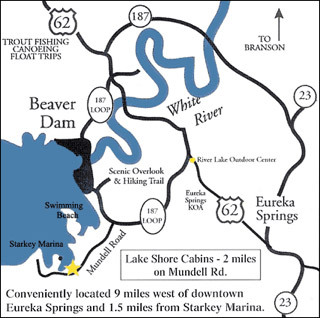 We look forward to welcoming you to our rental cabins in Eureka Springs.